Tolo News: Speaking at an Afghanistan Law and Political Studies Organization gathering in Kabul on Thursday, Qanooni said: “CIA’s site office in Islamabad was coordinating with (Pakistan’s) ISI; this office recommended to the US that any alternative to the Taliban must be a Pashtun-oriented alternative and that the United Front shouldn’t be an alternative to the Taliban at any cost,” said Qanooni. 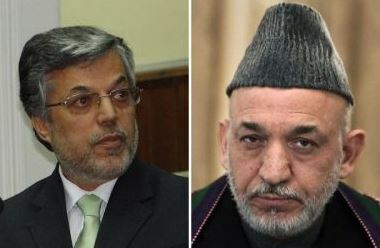 On the nomination of Hamid Karzai as Afghanistan’s president post-Taliban, Qanooni said the US and the international community had already decided on Karzai as new president even before holding the Bonn Conference. Click here to read more (external link). Yes; you are right but you are smart enough to not mention that the Anglo/US parasites wanted to include a Shia element in it as well- so, the will be able to turn the honorable ethnic groups of Afghanistan against each other. YOU GUYS IN POLITICS MUST ADD ALL THE DETAILD, OTHERWISE, THE INFORMATION COULD TURN THE OPPOSITE OF WHAT IT MEANT TO BE. WHAT I ASSERTED ON MY FIRST COMMENT.